This is an easy ride through a pretty and scenic landscape, with modest mileage and little elevation gain. Most of the trail mileage on the route is narrow enough to be moderately engaging while still being completely non-technical. When you put those together, what you have on your hands is a great beginner ride. This is an option that is suitable even as a first step up for riders who have ridden nothing but casual trails and flat gravel paths so far. This is a ride route that has become available to bikers fairly recently. The Rancho San Vicente property that was added to Calero County Park in 2009 constitutes a major expansion of the park's total area. The vast majority of the ride you see on this page takes place in this new portion of the park. About 70% of the trail mileage of this loop—essentially all of the ride's singletrack mileage—is made up of trails that were built after this addition and were opened to the public in March 2018. Admittedly, most of this "singletrack" is really what our local park agencies call "multi-use trail", which is four feet wide, though there are thankfully some stretches on this ride that are more like three and even two feet in width. One of the greatest assets of this route is the scenery. The ride takes place in a landscape that's very pretty through most of the year and simply idyllic in the greenery of early spring. The setting alternates between grassy hills and sparse oak woodlands. The southeastern end of the route is subject to the views of the pretty Calero Reservoir as a constant accompaniment. In much of the northern part of the route, your views will consist of thin neighborhoods on the fringes of suburbia and will sometimes open up all the way to the southernmost reaches of the Santa Clara Valley. As I've already mentioned in passing, the trail mileage on this route, wide or narrow, is all completely non-technical at the time I write this. Many trail segments are covered in a fine, gray gravel layer. The rest is smooth dirt. Ignoring for a moment a few climbs here and there, this is a route that can be done even on hybrid bikes and possibly on non-specialized road bikes or beach cruisers. I've also mentioned above that there's very little climbing involved in this ride. There are one or two steep stretches on this ride, but anything with more than 10% grade is over in seconds. Extended uphill stretches never have an average grade more than about six percent. The ride begins from a parking lot that's been added to Calero County Park along with all the new trails that were built in the Rancho San Vicente addition. This free lot is of a decent size. The bad news is that there aren't many overflow parking possibilities if you happen to find this lot all filled up. The area surrounding the trailhead isn't parking-friendly, and the other parking lots of Calero County Park either have no bike-legal trail connections to this route (as in the case of the boat launch and main entrance parking lots) or have such an arduous and long trail connection leading to it that they would change the entire character of your ride (as in the case of the lot at the Casa Loma entrance). Your only realistic backup option may therefore have to be parking in the boat launch area and pedaling for two miles on McKean Road to get to this trailhead. The route can be roughly described as consisting of one loop all the way around a ridge neighboring Calero Dam on one side, along with a much smaller second loop tagged on near the parking lot. Seeing a ride route with two sub-loops might easily bring to mind at least two question. The first would be about the direction in which to traverse each sub-loop. For the large loop, I don't have a strong preference. The route you see plotted here does this loop counter-clockwise. This breaks up the climbing portion a little bit, though at least a mile or so of the climb that you do is a bit steeper than the average slope you'd experience if you did the ride clockwise. Meanwhile, doing the ride clockwise would have you mostly descending toward the reservoir lake when you're within view of it, rather than partially climbing away from it as in the counter-clockwise case. The second question would be which subloop to complete first. There's really no bad answer to this question either, since this is a fairly short and easy ride. Still, for greener riders who are not confident of the physical shape they're in, it might be preferable to leave the smaller loop for last, as I've done on this ride, since that would then allow you to leave that out in case you find yourself getting tired toward the end. There aren't many other things that stand out about the ride. The only exception that comes to mind is a little vista point along Lisa Killough Trail labeled as "Lisa's Lookout". Despite its name, the view from this spot didn't look very impressive to me. However, the cute picnic tables set up there along with its closeness to the trail makes it a decent place for a quick breather. This ride can be easily extended in multiple ways, although all of these extension options would make your ride much tougher or more technical or both, which may be desirable to many riders, but not to those who show interest in this option due to its ease. One possibility is to continue west on Almaden Trail from the smaller sub-loop of the ride to reach Almaden Road. Pedaling southbound for a little less than 1.5 miles on this road would then bring you to the Hacienda trailhead of Almaden Quicksilver Park. Or you can head northwest on Almaden Road instead and turn left onto Mockingbird Hill Lane to use another entrance of the same park to ride Virl O. Norton Trail, which starts out a little more flatly. Another possibility is to move onto Santa Teresa County Park after this ride. To do that, you should head north on Fortini Road straight from the entrance of this ride's parking lot and you'll find yourself right by the Fortini Trailhead of Santa Teresa. You can then take Fortini Trail to head into that park for some easy mileage or attempt to climb the very rocky and tough Stile Ranch Trail instead for a challenge. 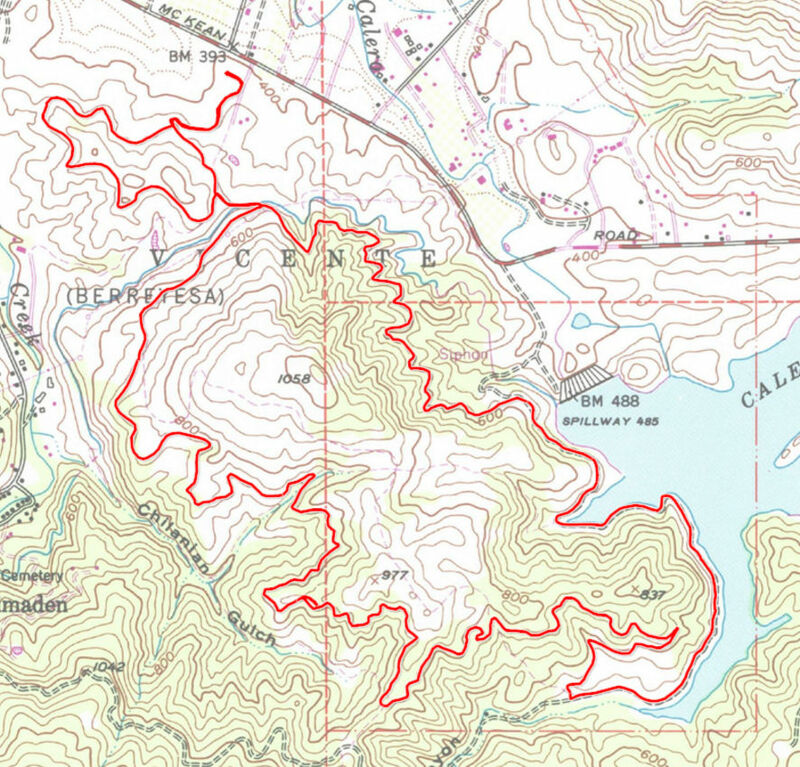 The last option I can see is to head west on Cottle Trail to connect to Chisnantuk Peak Trail and climb the latter all the way to Rancho Cañada del Oro. I haven't tried this myself and don't know the details firsthand, but the climb on Chisnantuk Peak Trail looks like it should have a fairly judicious grade, though it will still mean about an extra 1000 feet of elevation gain for you, more than doubling this ride's total climbing, not to mention the 7 miles this will add to your round trip.